The top rail has carved gadrooned decoration with a central shield & flower design. This is supported on each side by turned & fluted columns leading down to the upholstered arms. These have a scroll support underneath each arm. There is a moulded & shaped front rail supported by 2 turned & fluted front legs on brass castors. The two back legs are of splay design, again with brass castors. 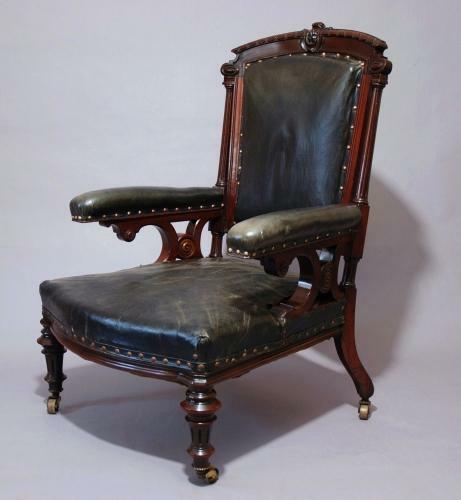 The back, arms & seat have been re-upholstered, some years ago, in a black, leather look material, possibly Rexine & this has a slightly worn appearance. The upholstery is fixed with copper dome-headed studs. The frame of this chair is in excellent condition. We are attributing this piece to C & R Light, one of the larger wholesale furniture makers in London in the late 19thc - early 20thc. They were based in Curtain Road, Shoreditch & this area was the hub of the International furniture trade at this time. An exact chair frame & similar upholstery can be seen in 'Designs & Catalogue of Cabinet & Upholstery Furniture & Looking Glasses' by C & R Light, Volume 2.